The Bagillt War Memorial commemorates those men of the area who died in the First and Second World Wars. The marble memorial, of a soldier standing on a plinth, stands on the High Street. Bagillt is a small town on the Dee Estuary in Flintshire. Between 1974 and 1996 it was in the county of Clwyd. The base of the memorial is inscribed with a poignant verse by the bard Ellis Evans (Hedd Wyn), who himself was killed in World War I. A'u gwaed yn gymysg efo'r glaw. (SS Tummel - Hull) 24 Feb 1916 63 Son of the late Stephen Marling Atkinson, & Sarah Atkinson; husband of Alice Atkinson (nee Curtis), of 82, Somerset Street, Hull, Yorkshire, England. Resident of Gadlys, Bagillt. Tower Hill Memorial, London, England. (14th Bn.) 14 Feb 1917 21 Son of John & Priscilla Bellis, of Old Engine, Coleshill. Bard Cottage Cemetery, West-Vlaanderen, Belgium. (10th Bn.) 2 Mar 1916 21 Of Colehill Farm, Bagillt. Son of Thomas Bevan, of 3, Foulke's Terrace, Station Road, Bagillt. Menin Gate Memorial, Ieper, West-Vlaanderen, Belgium. 10807 9th Queen's Royal Lancers 27 Mar 1918 23 Son of William and Margaret Bevan, of Glyn, Coleshill, Flints. Also named on the Flint War Memorial. Pozieres Memorial, Somme, France. ("D" Bty. 162nd Bde.) 11 Jul 1918 20 Of Roseneath, Bagillt. Son of Joseph & Alice Blackwell, of 8, Evan Street, Flint. 245966 1st/5th Bn. Durham Light Infantry (formerly 4805, King's Liverpool Regiment) 7 Jun 1918 19 Son of the late Thomas and Jane Bragg, 56 Claypole Street, West Derby, Liverpool. (1901 Census) Perreuse Chateau Franco British National Cemetery, Seine-et-Marne, France. 87594 Machine Gun Corps Infantry 26 Feb 1919 21 Son of William & Martha Catherall, of Red Lion Hotel, Bagillt. St. Mary's Churchyard, Bagillt. Annie Civilian 7 May 1915 Daughter of Margaret Crosby, of Foel Gron, Bagillt, & the late Edward Crosby. Drowned in the sinking of the Lusitania by a German submarine off the coast off Kinsale, Cork, Ireland. Resident of Vancouver, British Columbia, Canada. Ellen (Nellie) Civilian 7 May 1915 36 Daughter of Margaret Crosby, of Foel Gron, Bagillt, & the late Edward Crosby. Drowned in the sinking of the Lusitania by a German submarine off the coast off Kinsale, Cork, Ireland. Resident of Vancouver, British Columbia, Canada. (1st Bde.) 12 Jun 1916 30 Son of Margaret Crosby, of Foel Gron, Bagillt, & the late Edward Crosby. Native of Liverpool, England. Lijssenthoek Military Cemetery, West-Vlaanderen, Belgium. (14th Bn.) 2 Mar 1916 38 Husband of S Jane Dale, 4, Conway's Row, Bagillt. Guards Cemetery, Windy Corner, Cuinchy, Pas de Calais, France. 117751 52nd Bde. Royal Field Artillery 22 Apr 1918 24 Son of James and Sarah Ann Driver, Nant-y-Moch, Bryntirion, Bagillt. Also named on the Halkyn War Memorial. La Targette British Cemetery, Neuville-St. Vaast, Pas de Calais, France. Bagillt. St. Mary's Churchyard, Bagillt. (17th Bn.) 12 Jul 1916 24 Son of John Henry & Phoebe Evans, of 2, Neston View, Bagillt. Thiepval Memorial, Somme, France. (10th Bn.) 13 Nov 1916 29 Born Mold, Flintshire. Thiepval Memorial, Somme, France. (9th Reserve Bty.) 6 Mar 1917 23 Son of Edward & Elizabeth Evans, of Pierce's Row, Bagillt. New Brighton Cemetery, Bagillt. (25th Montgomeryshire and Welsh Horse Yeomanry Bn.) 11 Mar 1918 29 Of 5, Walk Cottages, Bagillt. Brother of W E Higginbotham, Cambrian Row, Bagillt. Jerusalem War Cemetery, Israel. (13th Bn.) 22 Apr 1918 33 Of 1, Glanrafon Terrace, Bagillt. Son of the late William & Ann Hughes, of Morfa Cottage, Walwen, Bagillt. Pozieres Memorial, Somme, France. (8th Bn.) 11 Jun 1917 33 Son of Joseph & Elizabeth Hughes, of Old Wesley Mount, Bagillt. Lijssenthoek Military Cemetery, West-Vlaanderen, Belgium. formerly Manchester Regiment 26 Sep 1916 24 Son of Thomas & Susan Humphreys, Sea View House, Whelstone, Holywell. Thiepval Memorial, Somme, France. Denbighshire Yeomanry 8 Nov 1918 28 Born Llanrwst, Denbighshire. Only son of the late Christopher and Anne Irvine, of Holyhead. Of 1, Reece Terrace, Bagillt. FiancÃ© of Miss Mildred Anna Williams, Glen Haven, Colwyn Bay. Also named on the Flint War Memorial. Terlincthun British Cemetery, Wimille, Pas de Calais, France. (196th Coy.) 31 Jul 1917 24 Son of John & Margaret Jones, of 4, Rising Sun, Bagillt. Vlamertinghe New Military Cemetery, West-Vlaanderen, Belgium. (5th Bn.) 19 Aug 1915 18 Brother of George Owen Jones, 4 School Row, Ffynnongroew, Mostyn. Also named on the Ffynnongroyw and Picton War Memorials. Helles Memorial, Turkey. (14th Bn.) 25 Feb 1917 24 Husband of Catherine Jones, of 3, Old Quay, Greenfield, Holywell. Of Llwyn, Bagillt. Bard Cottage Cemetery, West-Vlaanderen, Belgium. (1st/5th Bn.) 7 Mar 1918 20 Son of Adeline L Jones, of Fferm Farm, Bagillt, & the late Thomas Jones. Gorre British and Indian Cemetery, Pas de Calais, France. (10th Bn.) 2 Mar 1916 20 Son of Alfred H & Louisa Jones, Old Yard, Bagillt. Of Penycob, Bagillt. Menin Gate Memorial, Ieper, West-Vlaanderen, Belgium. (5th Bn.) 10 Aug 1915 24 Son of Humphrey & Sarah Jones, TÅ· Maen, Bagillt. Helles Memorial, Turkey. 20862 5th Bn. Royal Welsh Fusiliers 4 May 1917 31 Husband of Elizabeth A Jones, River View, Bagillt, Flintshire. (1911 Census). Also named on the Rhesycae War Memorial. Savona Memorial, Italy. ("C" Coy. 25th Montgomeryshire and Welsh Horse Yeomanry Bn.) 21 Sep 1918 20 Son of George & Catherine Jones, of 12, Neston View, Bagillt. Vis-En-Artois Memorial, Pas de Calais, France. (Anson Bn.) 25 Aug 1918 22 Son of Sarah Jones, 1, Kimberley Terrace, New Brighton, Bagillt. Vis-en-Artois Memorial, Pas de Calais, France. (13th Bn.) 28 Nov 1918 27 Son of Edwyn Jones, Fern Cottage, Bagillt. St. Mary's Churchyard, Bagillt. (14th Bn.) 10 Jul 1916 20 Son of Margaret Jones, of 4, Rising Sun, Bagillt, & the late John Jones. Dantzig Alley British Cemetery, Mametz, Somme, France. (15th Bn.) 31 Jul 1917 20 Son of Susannah Jones, of Gorphwysfa, Station Road, Bagillt. Menin Gate Memorial, Ieper, West-Vlaanderen, Belgium. (1st Bn.) 23 Aug 1918 23 Son of Jane Lloyd, of 2, Pierce's Row, Bagillt, & the late James Lloyd. Foncquevillers Military Cemetery, Pas de Calais, France. (15th Bn. ) 6 Feb 1917 24 Son of Thomas & Mary Ann Lloyd, of 6, Neston View, Bagillt. Essex Farm Cemetery, West-Vlaanderen, Belgium. Royal Welsh Fusiliers 10 Oct 1918 39 Born at East Stonehouse, Devon, England. Of Glamorfa, Bagillt. Died at sea. Hollybrook Memorial, Southampton, Hampshire, England. A George Of Pierce's Row, Bagillt. (14th Bn.) 8 Jul 1917 21 Son of Robert and Margaret Morgan, of Bagillt. 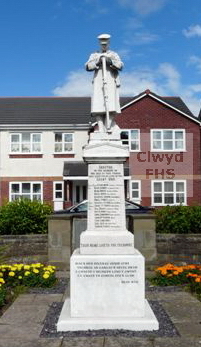 Also named on the Connah's Quay and Shotton War Memorial. Etaples Military Cemetery, Pas de Calais, France. (1st Bn.) 27 Feb 1917 30 Son of Jane Morris, Conway Row, Bagillt (1911 Wales Census). Queen's Cemetery, Bucqoy, Pas de Calais, France. (14th Bn.) 29 Dec 1917 21 Son of Edward & Margaret Morris, of 6, Barker's Row, Bagillt. Croix-du-Bac British Cemetery, Steenwerck, Nord, France. Royal Field Artillery 4 Oct 1917 19 Son of Francis & Mary E Tattum, 8, Talbet Terrace, Bagillt. Of Coetia Gwyn, Bagillt. Tyne Cot Memorial, West-Vlaanderen, Belgium. (1st Bn.) 16 May 1915 31 Husband of Abegail Thomas, of 8, Powell's Terrace, Bagillt. Le Touret Memorial, Pas de Calais, France. (5th Bn.) 15 Jan 1915 33 Son of Joseph & Mary Thomas, of Bagillt; husband of Annie Thomas, of 2, Emlyn Cottages, New Brighton, Bagillt. New Brighton Cemetery, Bagillt. (5th Bn.) 16 Aug 1915 36 Son of Thomas John & Mary Ann Williams, of Pentre, Flint; husband of Susanah Williams, of 7, Powell's Terrace, Bagillt. Helles Memorial, Turkey. (1st/5th Bn.) 10 Aug 1915 20 Son of John & Mary Williams, of Spring Hill, Top Works, Bagillt. Helles Memorial, Turkey. S.S. Marcella 13 Mar 1943 20 Son of Peter Francis Bannon & Cecilia Bannon (nee Maguire), of Rhosddu, Wrexham, Denbighshire. Husband of Cecilia Catherine Bannon, 70 River Bank Estate, Bagillt. Sunk off Cape Finisterre, Spain by German submarine. Also commemorated on the Holywell War Memorial. (2nd Bn.) 5 Aug 1944 25 Bayeux War Cemetery, Calvados, France. (2nd Bn.) 26 Aug 1944 25 Taukkyan War Cemetery, Burma. (2nd Bn.) 11 Mar 1943 24 Son of Samuel & Mary Elizabeth Blythin, of Bagillt. Krakow Rakowicki Cemetery, Poland. Joseph Edward Royal Army Medical Corps 4 Jun 1945 23 Liveramentu Cemetery, Colombo, Sri Lanka. H.M.S. Peregrine 18 Aug 1940 23 Son of Edward and Sarah Davies, of Bagillt. St. Michael's Churchyard, Caerwys. 1453976 7th Bn. King's Own Royal Regiment (Lancaster) Between 25 May 1940 and 28 May 1940 23 Estaires Communal Cemetery and Extension, Nord, France. (1st Bn.) 18 Mar 1943 26 Rangoon Memorial, Burma. (8th Bn.) 21 Jun 1944 31 Son of Richard & Louisa Ellis; husband of Bera Ellis, of Mostyn. Orvieto War Cemetery, Italy. (85 Anti-Tank Regt.) 12 Sep 1944 26 Son of Harry & Sarah Ellen Evans, of Bagillt. Singapore Memorial, Singapore. (102 Sqdn.) 26 Jul 1941 Runnymede Memorial, Surrey, England. (85 Anti-Tank Regt.) 12 Sep 1944 37 Husband of Margaret Jane Hughes, of Bagillt. Singapore Memorial, Singapore. 4202730 King's Own Royal Lancaster Regiment (2nd Bn.) 15 May 1944 31 Son of Thomas & Mary Elizabeth Hughes, of Bagillt. Taukkyan War Cemetery, Burma. (111 Field Regt.) 20 Apr 1943 20 Son of Joseph & Hannah Louisa Jones, of Bagillt. Enfidaville War Cemetery, Tunisia. (4 Airlanding Anti-Tank Bty.) 24 Mar 1945 25 Son of John Norman & Edith Jones, of Bagillt. Reichswald Forest War Cemetery, Nordrhein-Westfalen, Germany. 1083429 97 (The Kent Yeomanry) Field Regt. Royal Artillery 14 Nov 1942 31 Son of Joseph Edward and Nellie Jones; husband of O Jones, of Shotton. Enfidaville War Cemetery, Tunisia. 4184201 Royal Welsh Fusiliers 18 Jun 1942 48 Son of Edward A Lloyd & Margaret J Lloyd, of Bagillt; husband of Louisa Lloyd, of Bagillt. New Brighton Cemetery, Bagillt. Mildred Eliza Civilian 21 Oct 1941 44 Wife of Arthur Lowndes. Died at Fishpool Farm, Bagillt. 618693 Royal Air Force 22 Jul 1941 24 Son of Thomas & Mary Martin, of Bagillt. Harare (Pioneer) Cemetery, Zimbabwe. (6th (10th Bn. The Royal Welsh Fusiliers) Bn.) 25 Jan 1944 23 Son of Mr & Mrs T McHugh, of Bagillt. Sangro River War Cemetery, Italy. (4th Bn.) 28 Aug 1944 33 Son of Edward Albert & Mary Louise Mills; husband of Ann Mills, of Flint. St. Desir War Cemetery, Calvados, France. (15 Bty., 6 H.A.A. Regt.) 24/25 Nov 1942 21 Son of Robert Hugh & Mary Ann Roberts; husband of Venda May Roberts, of Bagillt. Yokohama Cremation Memorial, Japan. (4th Bn.) 14 Aug 1944 28 Son of John & Mary Ann Ryan. Banneville-Le-Campagne War Cemetery, Calvados, France. Emily Civilian 21 Oct 1941 12 Of Fishpool Cottage, Bagillt. Son of Emily Salter, and of Pryce Salter. Died in the bombing of Fishpool Cottage, Bagillt. Pryce Civilian 20 Feb 1943 50 Of Y Bwthyn, Walwen, Bagillt. Widow of Pryce Salter. Injured 21 October 1941, at Bagillt; died at Ashover, Chesterfield, England. Air Raid Warden 21 Oct 1941 57 Of Fishpool Cottage, Bagillt. Husband of Emily Salter. (68 Bty., 186 M H.A.A. Regt.) 17 Nov 1943 39 Son of Peter & Elizabeth Ann Seville; husband of Sarah Harriet Seville, of Cefn y Bedd, Flintshire. Greenfield Cemetery, Holywell. (7th Bn.) 17 Jul 1944 19 Son of William George & Florrie Shaw, of Bagillt. Banneville-le-Campagne War Cemetery, Calvados, France. (4th Bn.) 14 Aug 1944 28 Husband of Winnie Spencer, of Pentre Halkyn. Banneville-le-Campagne War Cemetery, Calvados, France. 1075749 Royal Air Force Volunteer Reserve 27 Jul 1941 30 Son of Mrs M Swindley, of Connah's Quay. St. Mary's Churchyard, Bagillt. H.M.S. Juno 21 May 1941 28 Son of John Edwin & Annie Thomas, of Bagillt. Sunk off Crete by by Italian aircraft. Plymouth Naval Memorial, Devon, England. 4191250 Royal Welsh Fusiliers 17 July 1943 27 Son of John & Anne Waring; husband of Ellen Waring, of Bagillt. Syracuse War Cemetery, Sicily, Italy. H.M.S. Magic 6 Jul 1944 23 Son of Robert & Sarah Williams, of Bagillt. Sunk off Normandy, France by a German "Neger" Torpedo. Hollybrook Cemetery, Southampton, Hampshire, England. 813209 Royal Air Force (Auxiliary Air Force) 9 Nov 1943 26 Son of Thomas Longford Williams & Dorothy Williams, of Bagillt. Grahamstown New Cemetery, Eastern Cape, South Africa.